The result of poor sanitation and/or improper water chemistry. Rashes and irritations are usually the direct result of inadequate sanitation and/or spa water chemistry. Sanitizing is a must, for proper spa water management. Salt Chlorine generators are a better way to utilize chlorine, producing more controllable results. They eliminate the need to handle, measure or store chlorine products, while reducing buildup problems. An Electronic PockeTester Kit is a convenient way to monitor the salt level, as well the overall water chemistry. How to avoid spa rashes and irritations? Avoiding a spa rash or irritation, that might result from inadequate sanitation, bad chemistry, chemical dermatitis or sensitivity? Rashes and irritations in spas or hot tubs occur for two principal reasons: bacterial infections or chemical dermatitis. It is recommended that persons exhibiting these problems seek a medical opinion. Bacterial infections can be the direct result of inadequate sanitation. Chemical dermatitis can be the result of excessively high levels of chemical agents and/or extremes in pH or the presence of irritating, unwanted byproducts. Some individuals seem to be more sensitive, to even normal levels of common sanitizers, and may be helped by a switch to an alternative sanitizing method. If problems arise, refer to the Spa Problems Page, as a source of problem-solving information, broken down into various categories. Scroll down the page and click on the linked keywords, catch phrases or images, in the archived answers below, to access additional information, on that topic or product. Hi Alan, many thanks for your informative site. We are in New Zealand, have had a spa for 3 months: equipped with an ozonator, and silver stick, 1200 litres. After 1 week of use my son developed folliculitis, and the spa pool company advised that our spa was most likely infected by a visitor (who also owns a spa) who had used our spa. (The visitor did not have folliculitis). The pool was cloudy at this time, low pH, hard to get the chlorine level up. He advised to put in a new filter, change all water and clean out pipes with a swirl away cleaning product (repeat procedure twice) refill pool, and take water to a lab for testing of pseudomonas aeruginosa which all up would have cost another few hundred $$! Another spa pool rep advised to remove 1/3 of water and chlorine shock, and put soda bicarbonate in to get pH up. We went for the removal of 1/3 of water option. Addition of soda bicarbonate didn't affect pH, and then I found your advice of using soda ash which worked well on getting pH to 7.2 and alkalinity to 120-180. We usually add a few teaspoons of chlorine, after each use and shock once a week. Since we have had the spa we have to add more and more chlorine to try and get levels of 3 ppm. In fact, lately I have been adding chlorine and retest 24 hrs later and free chlorine level is 0. We have tried 3 different types of chlorine and nothing seems to make any difference to getting chlorine levels up. I would like to know which is the best to use: a) sodium dicloroisocyanurate min 560g/kg, b) sodium dichloro-s-triazinetrione dihydrate, c) 350g/kg available chlorine present as lithium hypochlorite. We have not had any more folliculitis since the first episode. I would be most grateful if you could shed some light on all this as we feel we are fighting a losing battle! Thanks in advance for your assistance. Regards. I don't think the first spa company understands the problem. Pseudomonas at infectious levels can cause folliculitis and it can be introduced, in any number of ways. Testing for it will prove nothing, as it most surely is there. You need to minimize the levels. In other words, you need to kill virtually all of it and keep the water properly sanitized. It is hard to keep bacteria out of a spa, that people use. Normal people have almost 2 kg of microorganisms living on or in their bodies. They range from benign to pathogenic, with the most infectious living in the intestinal track. We can't live without them. The problem arose because of inadequate sanitation. Ozone is great, but is quickly disappears, once the pump is off. Silver has its limitations. Right now, you need to use either dichlor (A and B are different names, for the same chemical.) or lithium and get the free chlorine to 5-10 PPM. Test and add more product, as needed. Keep it elevated for at least 12 hours. Maintain the pH at 7.2-7.6. Maintain the free chlorine level at 2-4 PPM, from this point on. Add some chlorine, after each use and retest the water, before and after each use. If you add a dose of sodium bromide, each time the spa is refilled, the chemistry will function as bromine, even though chlorine is being added. Bromine seems to work better, under these conditions. 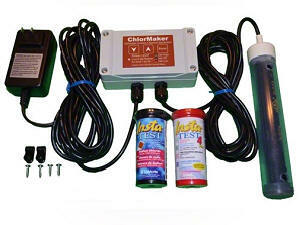 You could also replace chlorine additions with a salt chlorine generator, which will provide better control and results. It works well with ozone and silver, too. If you add 250 grams of sodium bromide, along with the required amount of salt, it will generate bromine, instead of chlorine. We have 2 models, that are smart enough to only produce chlorine/bromine when it is actually needed and they work independently of the pump and require no installation. I hope that the information provided was helpful. ► What's Causing This Rash? I find your site very useful! My husband and I purchased a hot tub about 5 months ago, and enjoyed it greatly with seemingly no problems for the first couple of months. Then my husband started to have skin reactions. The advice from the spa shop that sold us the chemicals (bromine, tabs and dichlor/bromine combination powder) was to do a decontamination with super chlorination, even though it was a brand new spa. We followed that advice, and while we weren't able to use the spa his skin had healed. But the reactions continued once the spa was decontaminated, drained and refilled (twice). It is only my husband that has the reactions. I and my 3 daughters are fine. The reaction he gets is more like dry skin with redness, itching, and peeling, than a typical folliculitis reaction. I know your advice would be to seek a doctor's opinion where that is concerned, so my question isn't really regarding that. The first thing we tried, upon advice from the salespeople at the spa shop, was to try biguanide. So we did, and let me tell you I have never been so disgusted in my life. However, it was pretty easy to balance our water, pH was good as well as clarity and my husband's skin was perfect with absolutely no irritation. But both of us hated the smell of biguanide, and the spray it generated while using the tub would work its way into our mouths and tasted so bitter. Plus, having read over and over again that eventually we'd develop a resistant water mold and have to switch sanitizer again anyway, led us to drain the tub and try bromine again, this time with the addition of a spa mineral sanitizer (our tub is also equipped with an ozonator, but it doesn't run continuously like on the higher end tubs--ours only runs when the pumps are running a filter cycle or when we use the tub). At any rate, even with a low level of bromine residual in the tub, 1-2 ppm he is having reactions again. I am so frustrated. I don't really know if there are any other options for him. Most of the alternative sanitizers don't really seem to be EPA approved. The only other one, recommended to us, by our hot tub manufacturer, won't disclose anything about the chemistry, it's super expensive, AND most of the advice I've seen is to continue using your regular sanitizer along with it. I understand it's meant to reduce biofilm formation. But I have seen plenty of reviews of people getting rashes while using it too. The only other thing I can think to try at this point is adding borates, to stabilize pH and give the water a softer feel. He does shower after using the tub and apply lotion which helps a little, but he is still getting itchy. I am not willing to use biguanide again or give up the hot tub since 4/5 of the family enjoys it problem free. Do you have any suggestions? Thank you so much for your time! You probably didn't expect a reply so quickly, but here it is. It would be safe to assume that your husband has used swimming pools, that were sanitized with chlorine. It is almost certain that he never used a pool sanitized with bromine. The bromine tablets contain a component, that is only found in water treated with bromine tablets. That ingredient is dimethyl hydantoin. Over the years I have received many letters, sim ilar to yours, and the use of bromine tablets. I have never received one that involves the bromine 2-part system, which is not tablet based and does not contain dimethyl hydantoin. Based on this anecdotal information, I believe that the problem is the dimethyl hydantoin. Most likely your husband never encountered this compound, until you got a spa. I suggest the your husband consult a dermatologist, as I am not medically qualified. I have no idea whether your husband is hyper-sensitive or if it was due to poor chemistry or sanitation. Poor sanitation or chemistry usually affects more than just one person. I would drain and clean the spa and refill using granular sodium dichlor. It will still leave open the possibility that cyanuric acid, a component of sodium dichlor is the causative agent, but that ingredient is widely used in most residential pools, while dimethyl hydantoin is not. If this proves successful, there are options going forward. Using a salt chlorine generator will eliminate the dimethyl hydantoin and the cyanuric acid. 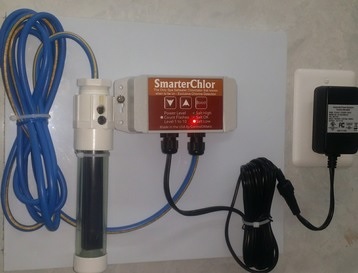 The NEW SmarterSpa Salt Chlorine Generator automatically maintains a proper level, turning it self on and off, depending on the actual chlorine content. Its plug-n-play design requires no installation. Using the ozonator should allow you to reduce the chemical footprint. It should be used with chlorine and works really well with a salt chlorine generator. I am not a big fan of biguanide, for the same reasons you mentioned. And I don't like sanitizing methods that are not EPA registered. I call them voodoo chemistry. Please let me know how this turns out. I hope that the information provided was helpful. Alan, a follow up and a thank you. My husband's skin is able to tolerate chlorine! What a relief. I appreciate the advice as the 'experts' at my local spa store were only adding to the confusion and our growing pile of unusable chemicals. I understand that the salespeople at spa stores may not recommend using dichlor alone to most people, as it is more demanding and needs a lot of babysitting/frequent water changes. Actually I am using the dichlor-then-bleach method, and it's working very well for us, for now. At some point in the distant future, maybe we'll try bromine again without the tabs. Thanks again! I'm glad to hear that things are looking up. Do you really want to give bromine another chance, even if it is with the 2-part system? You're getting good results with chlorine and the ozonator. Why not add the chlorine, in a better way, and eliminate the byproducts, such as cyanuric acid? A salt chlorine generator is a better way to do chlorine. Just a few pounds of salt, each time the spa is refilled, and it produces all the chlorine the spa requires. Because of the ozonator, you should be able to manage with a lower level and have fewer problems with odors. This will simplify maintenance and reduce the chemicals being added to the spa. I am glad, that this had a happy ending and that you shared it with me. I hope that I have provided the long-term solution. Hi and I hope you can help. We have had a spa at our weekend home in Michigan since December of '09. About a year ago I started getting dry, itchy patches all over my body (except head and neck). After finally going through allergy testing it was determined that I am allergic to persulfates and that I should avoid potassium peroxymonosulfates which I guess are typically found in non-chlorine shock. Since I am not the one who maintains the spa and I am not there I am not sure what kind of shock we use. We use a bromine system. My doctor said that switching to a full chlorine system would probably help - but I don't like the chlorine smell. I wonder if you have any thoughts or experience dealing with this issue. We are wondering about ozonator or other alternative cleaning methods. Thanks in advance. I can't argue with the Doctor's findings. I have heard of this irritation problem before and it is attributed to the presence of excessive amounts of persulfate. Bear in mind that persulfates react with bromide ions, to convert it to bromine, and with organic wastes. This should happen in a short period of time. If you use the spa, immediately after adding non-chlorine shock, there could be excess persulfates present. If you add a Mineral Sanitizer, you will be add to get by with maintaining a lower bromine level. If you add an ozonator, it could eliminate most of the need to add shock. Should the bromine level bottom out or shock be required, you can simply add sodium dichlor. Hi, first may I say that this is the most helpful page I have come across. Thank you so much. Second, I got the spa to relax and the stress, of maintaining it, is making me more tense! My husband has come down with a rash, that we have linked to spa use. Which bring me to my question...you did not mention natural spa chemicals on your site. It uses no chemicals and I only have to treat it once every three months, I do have to purge my unit due to bromine use.. My question is, do you recommend this, and what are the downsides? Thank you so much for your time and expertise. Call me a skeptic! If you don't control infectious (pathogenic) bacteria, such as pseudomonas aeruginosa, you can end up with a rash or worse. The spa product that you are using may not be a recognized water sanitizer. Check the label. Does it have the EPA Registration number that a sanitizer must have? Evidently, this product, can under certain circumstances, work. However, I would rather use a product that I can measure and test and that works under virtually all properly maintained conditions. Unless, you want to risk a repeat, I suggest that you consider a more traditional spa water sanitizer. Salt Chlorine Generators, bromine, chlorine, mineral sanitizers, in conjunction with an ozone generator or a UV (ultraviolet) Sanitizer will afford much greater protection and better assure bather comfort. I'm glad that you found the website helpful. Good luck with your decision. After having a 550 gallon spa for 6 months, all of a sudden my son and I are getting an itch irritation, even when only in for a short time. We use bromine in a feeder cartridge and have changed the water a couple times. Seems to not be a problem the day after I change the water, but otherwise it is. I can tell you that I am not perfect about keeping all the factors in correct balance all the time. It is not used a huge amount, probably on average 10 total usages/week. I was told that draining and changing to chlorine would probably correct the problem. I have no problem doing this. Just checking another source. Thanks for your thoughts. What you are describing could be due to inadequate sanitation or chemical dermatitis due to high bromine levels and poor control of the pH. I suggest that you seek a medical opinion for treatment and proper diagnosis of the rash. By your own admission control of the spa chemistry was lacking. Switching to chlorine will solve nothing and might even worsen the situation. I suggest that you consider adding an ozone generator, as it will simplify maintenance and reduce chemical usage. Ozone generators should be used with a backup sanitizer such as bromine. With ozone, you should get very satisfactory results with a level of 1-3 PPM and this should make for less irritating conditions. I hope that this information proves helpful. How to reduce the potential for rashes and irritation. Use a salt Chlorine Generator for better sanitizer control and fewer byproducts. Ideal water chemistry improves sanitizer efficiency, reducing irritating conditions. A cleaner filter cartridge helps reduce sanitizer usage and improves water quality. 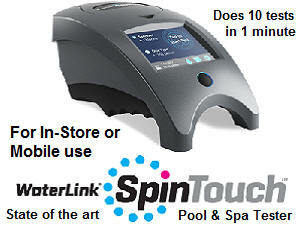 Nano-Technology products provide better water clarity and extend the lives of Spa Covers. Salt chlorine generators offer more control and less odor. Four models. A handy, battery-powered vacuum will easily remove debris. Maintain proper water chemistry, for better bather comfort. Keep the filter cartridge clean, for better water quality and results. 21st Century Nano Technology helps create better spa water clarity. ► Had Folliculitis - Now What? Sorry if this is redundant from archives. Recently got hot tub, and clearly under treated because my daughters have classic folliculitis. Tub has ozonator, and have been using weekly spa dichlor and a spa enzyme after use. pH and alkalinity seemed OK, by test strips. Chlorine reads low, but I thought that’s what I should expect with ozonator. Main question is after known folliculitis, do I need to drain and start over or can I just treat water aggressively — and if so what would you recommend? Thanks. Draining should not be necessary, but you should boost the free chlorine to 5-10 PPM and keep it there, for a least several hours , while running the pump. The chemicals you add are what prevents the water from becoming old bath water. The weekly addition of dichlor and the presence of the ozonator are giving you a false sense of security. The enzyme is not a sanitizer. You should try an keep the free chlorine at 2-4 PPM, for as much of the time, as possible. Having an ozonator means that it will take less product to maintain any given free chlorine level. It is best to test the water before and after each use and add product accordingly. 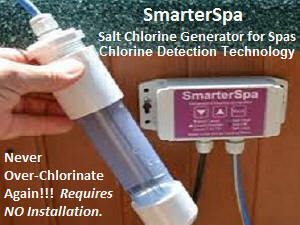 A salt chlorine generator is a better way to use chlorine, in a spa. It gives you more control over the free chlorine level and provides for a better experience. We offer a range of affordable models, in our website store, with most requiring no installation. I hope that this will help solve your problems. Best wishes for the new year. We have had a hot tub for 4 years and for the last six months, 1st me then my wife have developed a rash on our legs which we think is a reaction to the chlorine in the tub. If not, what ever the cause, the chlorine really brings out the rash and makes it worse. I have always been very careful about the chemistry in the tub as on occasions lots of people use it. When the kids come home for the holidays etc. I have kept the chlorine lever too high often which may make things worse. Is it common for people to have reactions to the chlorine? I have just ordered a purification product which consists of natural minerals which slides into the center of the filter. I have not tried it yet but the manufacturer stand behind the product and it is supposed to replace either chlorine or bromine and last for 4 months. Any feedback would be really appreciated. Thanks in advance. A spa rash can result from chemical dermatitis or a bacterial infection. I suggest that you seek medical advice, as to the likely cause and best treatment. Too much chlorine, haywire chemistry or bad water management can lead to chemical dermatitis. Inadequate sanitation can lead to skin rashes. The device that you are describing is called a mineral sanitizer. It cannot replace the need to add chlorine, bromine or other oxidizers! It may reduce the amount of these products that will be required, but it will not come close to eliminating their usage unless you have an ozonator. The combination of a mineral sanitizer and an ozonator can be very effective, especially if you maintain a low level of chlorine or bromine, as typically recommended. If you do not have an ozonator, I suggest that you consider adding one. Ozonators are very effective in helping to maintain quality spa water and avoiding the problems that you have described. Ozone will reduce the amount of chemicals being added, simplify water chemistry and reduce the chemical sensation. I hope that this information will prove helpful. Enjoy the holidays. If I had read the recent letters asking about rashes I would not have asked mine. Sorry. However my questions about the mineral sanitizing system I ordered (have not got it yet) that fits in the middle of the filter and how it works is a good question I hope. I would like to know about ozone systems and can I install a ozonator system in line in my hot tub? What is involved? Also when I tested my hot tub water last night (theoretical exercise as I am not getting it at present do to rash on my lower legs) the chlorine was high. I am using pucks and was interested to know that they are really for pools. In hot tubs they dissolve much more quickly out of the dispenser due to the heat of the water causing higher levels of Chlorine. The test results also showed the pH and total alkalinity were both low. I have to admit I don't know the importance of these two factors. Can they have anything to do with causing rashes. Looking forward to hearing from you. There's nothing wrong with asking the questions. With this additional information, it seems apparent that the spa rash could be chemi cal dermatitis. A medical opinion and treatment should be sought. Chlorine tablets (pucks) are not recommended by any spa chemical producer, as they will dissolve too quickly at the temperature of most spas and hot tubs, causing high chlorine readings. In addition, they are acidic and will lower the pH and TA. Low pH conditions can lead to heater corrosion and will make the chlorine more aggressive and irritating. Sound familiar? You can add an ozonator to your unit - it would be my choice. If you want to use chlorine, use granular sodium dichlor, as it is relatively pH neutral, or use a salt chlorine generator. If you want to use a floater, use bromine tablets, as they are slow-dissolving at spa temperatures. I suggest that you drain the hot tub and start over. There is little doubt that you caused some heater corrosion and, if you merely adjust the pH and chemistry, some staining could result. Drain and start with a clean page! Good luck and I hope that I have helped to solve the problem. ► Cause Of The Rash? I have used a hot tub for years - used a mineral purifier and an ozonator, with MPS shocks occasionally. We got a new tub about 6 months ago and have had numerous rashes. I have changed the sanitizer 3 times trying to eliminate the problem. We started with biguanide and I got a rash. We then went to a natural enzyme/minerals product and dichlor shocks. That was great for awhile, then got a rash. I continued to use the natural enzyme/minerals product and added a mineral purifier. Things got worse. I do have an ozonator on the tub and run the filter 12 hours per day. Today, I took a sample of water to my dealer and everything checked out good - except that he said the cyanuric acid was at 96 ppm, which he thought was quite high. I realize that too much CYA can inhibit chlorine, so I'm wondering. 1) could I be allergic to CYA - are people allergic to it?, 2) might the chlorine shocks not be doing their job because of the CYA level? I don't use much dichlor - maybe 1-2 times per week, so I don't know how the CYA could have gotten so high. I'm thinking of draining the tub and starting over, but I don't know what system to use. The testimonials about the enzyme/minerals product on the internet are great, which is why I started using it. I don't know if there is an ingredient in it that might be bothering me. For years I had no problem with mineral purifier and an ozonator. Can't figure it out. I've asked the dealer to come out and check the ozonator to see if it's working right. He said if the light is on, it's working. The light is on during the filter cycles. But, I'm from Missouri on this. Seems to me that if the ozonator is working right and, I'm using proper sanitizing, I shouldn't have this rash. Except for the possibility of the CYA. Your ideas will be welcomed. So far as the rash is concerned, I suggest that you see a doctor. He should be able to tell if it is a chemical dermatitis or a bacterial infection. I don't like "sanitizer systems" that I can't measure. If this enzyme/mineral product has to be used with dichlor, it is the dichlor that is carrying the sanitizing load. That doesn't mean that it doesn't help in some manner. In your case, it did not seem to produce satisfactory results and I suggest that you stop using the product. So far as biguanide is concerned, resistant microorganisms can develop after a few years of use. The previous problem could have been involved in some fashion. Biguanide and ozone are not ideal, as the biguanide can cause foaming and that can interfere with the ozonator's venturi effect. I suggest that you stop using biguanide. The high level of CYA resulted from the use of dichlor. Evidently, you used more than you thought. A level of 98 is not unusual for a pool and is not known to be irritating. In a spa things could be different, for some people, at the elevated temperatures. High CYA levels can reduce the effectiveness of chlorine. I suggest that you drain the spa, to eliminate most of the biguanide. Refill and add a stiff dose of chlorine: 5-10 PPM of Free Chlorine: This will destroy any residual biguanide. Recirculate through the system overnight and test for Free Chlorine. If present, drain and let's start over. Contrary to what the dealer said, the light being on is not enough! It may not be producing enough ozone because it needs a new "chip" or UV lamp (depending upon the type of ozonator) or simply because the venturi effect is not working. You should be able to smell ozone, right after removing the cover. When you receive the tester, take a sample close to the returns. I recommend that you verify that the ozonator is operating properly and that you use it in conjunction with the mineral sanitizer and chlorine or MPS. This is a very popular combination. It worked for you before. It avoids harsh chemicals, buildup problems and voodoo chemistry. If you need to replace the ozonator. I hope that this will help get you back on track. Please let me know how it turns out. Hello. Thank you for your spa information site, it is very helpful. And, it is the only scientifically sane source of information I have found so far. I'm sorry for the long story that follows, but I didn't want to leave anything out. I have an interesting problem, actually two of them. I have had my spa for about a year and a half, and have never had any problems whatsoever, until recently. When I run the pumps, I get a slimy yellow-brown foam in the parts of the water with low flow, or where there are eddy currents. This foam becomes very thick and attaches to anything that floats in the water as well as the sides of the tub above the water level. It has about the same consistency of the bacteria/algae or whatever combination that grows atop oily water. Just after this stuff started appearing, my girlfriend and I started getting a horrible rash like some of the ones described on your site. It actually took a while to associate this with the spa which we use at least once a day. When I figured it out, I drained the spa, dried it, and thoroughly cleaned it. Then, I refilled it and treated it per the instructions with the chemicals I bought. I do not have an ozonator, and I use bromine. Some background: When I first started using the spa, I bought a cheap starter kit from the hardware store. When that was used up I started buying the more expensive chemicals from a local spa store. They supplied me with a small bromine feeder, bromine tablets and some sodium bromide based powder. Since then, I was never able to get the bromine level where I wanted, it was either around 0-.5ppm or 8-10ppm. The people at the spa store kept telling me to add the recommended amount of sodium bromide, just that I needed to increase the bromine tablet feeder's output. They even sold me another larger feeder, and I used both. I finally got fed up and switched back to the cheap stuff, which is what I am using now. Well, I turned down the feeders a little, but not enough apparently. I started to suspect what I eventually learned on your site, that I am using far too much of the tablets, and too little of the sodium bromide. I bought a test kit that tests for free chlorine, which I never had before. The test strip ranges from 0 to 10ppm, 10 being a dark cyan color. Well, it turns pitch black in my water. Apparently, the expensive tablets didn't contain as much chlorine as the cheap stuff, and the chlorine is what is causing my rash problem..? I am presently treating the water with sodium bromide to try and correct this. Now back to the other problem. After refilling and treating the spa, the bromine level was at 2ppm, and has remained there since. The total alkalinity was around 160ppm, but has since risen above the 240 ppm that the testers read. The pH was about 7.4, and has remained there since. The "total hardness" was and is around 50ppm. The yellowish slime returned within a day of starting the spa. I have been told that it is mustard algae. This stuff does not conform to any sane description of mustard algae that I have found. When I described my situation to the people at the local spa store they sold me an algaecide, which has no effect. They also suggested I lower the total alkalinity, but didn't have an explanation why. They had me add a large amount of a sulfur based pH lowering powder, which made no sense to me, but I figured (incorrectly) they were the experts. It barely affected the pH, and had no apparent effect on the total alkalinity. Still no solution to the yellow stuff. What is it? Is it anything I need to worry about, other than the constant cleaning? I now disbelieve that it has a connection to the rash, which I attribute to the chlorine levels. The only odor I get is a very strong chlorine smell, which I used to think was normal. Of course, it could be masking any odor from the yellow slime. Kind regards. This will be this week's horror story. It could be chemical sensitivity, chemical dermatitis or inadequate sanitation. In any event, I suggest that you seek medical advice to help determine the cause and remedy. The foam is probably being caused by the reaction of body oils and the natural alkalinity of the water. This can cause the formation of a soap. Boosting the calcium hardness to 200 PPM can reduce foaming tendencies. While antifoam can help, it may only be temporary. The addition of an enzyme treatment can help digest the body oils and reduce soap formation. In order to properly sanitize a spa it is necessary to eliminate all foam, at least periodically. The ecology of the foam is different from the spa water and can harbor problematic bacteria. Defoaming and proper sanitizer levels help eliminate the potential problem. The yellow oily slimy stuff is probably bacterial in nature. Possibly some iron is present in the water. Adding sodium bromide does not increase the bromine level! If using bromine tablets, at most it should be added once. The sodium bromide can be converted to bromine, by the addition of chlorine or non-chlorine shock. However, it recycles back to sodium bromide, after reacting with organic wastes. Not having an ozonator is a major disadvantage. I suggest that you give it some serious thought! The combination of ozone and bromine is very effective and will produce water with little of no odor. The treatment for mustard algae was inappropriate! I suggest that you drain the spa and thoroughly clean it. Have the tap water tested for iron. Be prepared to add an iron treatment, such as Liquid METALTRAP, if present. Even better would be to use a METALTRAP Filter to treat all new water additions. Add this prior to adding any chemicals. After the spa has been refilled, add a dose of sodium bromide and enough sodium dichlor to boost the bromine level to 5-10 PPM. Keep it elevated overnight and operate the filter. Adjust the water chemistry to: pH 7.2-7.8, TA about 100 and calcium hardness to 150-200 PPM. The next day, if the water is clear and bromine is still present, you should be ready to start again. Add a single bromine floater, after the bromine level falls within the 3-5 PPM range. From this point on, maintain the level at 3-5 PPM. Test the water before and after each use. Add some dichlor or non-chlorine shock to boost the bromine level quickly, before and after each use. Bromine tablets are slow dissolving and do not play catch up effectively. Try an keep the floater reasonably full at all times and adjust the setting to suit the needs of your spa. An ozonator will allow you to maintain a lower bromine level and it will take comparatively little product to do that. The combination will provide backup sanitizing and much better results. I hope that this information proves helpful. ► Broken Out - But Avoidable? Hello, my name is Pam. We got A hot tub in the middle of January. We used bromine and, like always, only 1 person breaks out MEEEEEEE. So we drained the spa and started using chlorine. Trial by error is hurting me and the bills! Can you give some hints on using chlorine, its been 2 days and no chlorine is registering on the test strip. What shall I do? I want to get in, but I'm so broke out, I can't take a lot. Do you think we should shock it. You really should see a doctor about being broken out. It could be caused by inadequate sanitation or by chemical dermatitis. A doctor should be able to distinguish between the possibilities. You need more than just adding shock. You need to maintain a Free Chlorine reading of 1-3 PPM at all times! This means adding chlorine and shock regularly and possibly before and after each use. No chlorine means inadequate sanitation and that can lead to rashes. Because you are the only one being effected, it is possible that you are sensitive to bromine, in the hot water conditions. I suggest that you consider an alternative chlorine sanitizing method, such as a salt chlorine generator. It will eliminate the byproducts, common with traditional chlorine, and provide you with better results and more control. Good luck with the problem and I hope that I have been helpful. Ok now I'm mad. Chlorine ain't working either. The alkaline, pH all that's level. We got an ozonator on it and the rash keeps getting worse. Now what help if possible what was the mineral stuff going to be. Help. Sorry about the problems, but there is nothing I can suggest without knowing what the chemistry is! What is the free chlorine level, the pH and the TA. Are you positive that the ozonator is working? How many hours a day? Have you seen a doctor to determine if it is folliculitis or chemical dermatitis? Hay it's Pam. What is free chlorine level and total alkalinity? And as far as time once a day for about 35 minute for the ozonator. You are not maintaining your spa properly or responsibly. pH is important for the chlorine or bromine to function properly, for bather comfort and corrosion considerations. Total Alkalinity helps stabilize the pH. The pH should be maintained at 7.2-7.8 and the TA at about 80-120 PPM. Free chlorine is the active, sanitizing form of chlorine. It should be maintained at 1-3 PPM, at all times, as is possible! No free chlorine probably equates to inadequate sanitation, due to too little product or too much bather usage. You can't just add some chemicals, even if according t o the label, as these are just guides: your spa might require more or less! Operating an ozonator for only 35 minutes a day is ineffective and a waste of time. Ozone does not remain in the water for extended periods of time. The best way to maintain the effect of ozone is to operate the ozonator for periods throughout the day. I suggest that you try to ozonate for 4, 2-hours periods, spaced apart throughout the day. Ozone will make it easier to maintain the water and reduce the amount of chlorine that needs to be added, to maintain a given level. A mineral sanitizer can act as a backup sanitizer and help reduce the need for chlorine. All these products are great. If you use them properly! You have not been treating the spa water effectively and this is the most likely cause of the problem. I suggest that you read through the website, discuss the proper operation of the spa and the maintaining of the water chemistry with your dealer. Going forward, you might consider a salt Chlorine generator, as it will simplify maintenance. 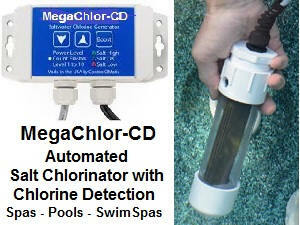 We have 2 models, that are smart enough, to only produce chlorine, when it is actually needed. They will prevent you from over chlorinating. All you'll have to do is add pH reducer, as needed to keep the pH at 7.2-7.8 and monitor the free chlorine, to make sure all is going according to plan. If you want to enjoy the spa, you will have to do more. I hope that this information will help motivate you into taking a common sense approach. Good luck. Editors note: all the problems could have been avoided with some basic understanding of what is necessary to maintain proper spa conditions. Everything was there, just not being used correctly or effectively. Dear Alan, we use bromine in our hot tub. When we first purchased the tub, I was able to use it almost daily with no skin irritation/rash at all. After a few months, we went on vacation and when we returned, I began to itch when I got out of the hot tub. The itching usually began the next morning. I stopped using different lotions, etc. that I thought may be triggering the rashes. They appeared only on my legs and in blotches. I went to the doctor. and she prescribed a steroid lotion. This is the only thing that really takes away the itch. Whenever I get in hot water (not just the hot tub anymore) I break out in the rashes. They occasionally show up on my arms and torso. The worst place is on my legs (and most consistent place). I use lotions/creams daily. No one else in my family is bothered by this at all. Any ideas?? The itching is horrible and I really miss being able to use my hot tub. Thank you. Based on the information that you provided, it is not clear that you are sensitive to any specific chemicals, considering the fact that you break out from other hot water situations. No matter what I suggest, there will be no real assurance that it will work. It sounds like this is a new problem, as opposed to your breaking out all of your life from hot baths. Perhaps, you have become sensitized by some of the chemicals used in the hot tub. The bromine would be the most likely, because it contains byproducts that are not overly common. Obviously, you should follow the medical advice, but I would move towards using more innocuous chemicals and as few chemicals as possible. My recommendation would be to use an ozone generator, as the prime means of maintaining water quality and use a mineral sanitizer as a backup sanitizer. This combination will be less reliant on chemicals, especially those organic compounds more likely to cause sensitization. Before doing anything, drain and clean the hot tub. Thereafter, drain and clean every 2 months, to avoid possible buildup problems. If this works - great! If not, you've invested in a sanitizing system, that should provide better quality water for the family. I hope that it works out for you. We had our hot tub for 2 months. Then I developed a itchy rash on my lower back, chest and eventually my forearms and legs. Since we were new owners and had had a fair number of people in the "new spa" we assumed bacteria and emptied the spa, washed down all surfaces with a 10% chlorine solution and added bromine to 30ppm to shock the new water. I still got a severe rash. So then we did the decontamination procedure (with the formula of 100 ppm of chlorine, etc.) listed on government sites. I could then use the spa for 15 minutes at time with only a few bumps which did not persist for any length of time but came 6-8 hours after usage. Nobody else has ever gotten a rash, before or after all this treatment. We have paid particular attention to shocking the spa after use and keeping the bromine, pH and TA at the appropriate levels but a few days ago the water felt slightly slimy when we got in and I got a rash again on my arms and legs. Never under my bathing suit which is where they say folliculitis is most likely to occur!? We keep our temperature at 100-101 degrees F which we find comfortable so far this winter. Could we have a person who carries the pseudomonas bacteria infecting the spa? We have noticed a difference in the foaming of the water but we don't use the aerators much. With all this treatment, is it bacteria or chemical dermatitis that is likely bothering me and how do I find out to rectify the problem? Our healthcare provider figured it was folliculitis when I asked him and put me on the recommended antibiotic for 5 days and said I could use the hot tub again after 48 hours. I waited 72 hours and made sure I had no "red" rash and got more after being in the tub even while on the antibiotic?? Could it be heat rash? Any help would be greatly appreciated as problem solving knowledge seems to be hard to come by in our part of the world. I can't tell you if the spa rash is due to chemical dermatitis or folliculitis. I'll leave that to the medical professionals. The slimy conditions are indication of microorganism growth and this can lead to folliculitis. Ultra high chlorine or bromine levels can lead to chemical dermatitis. While I can't tell you the source of the problem, I can suggest that a possible way to avoid a recurrence. You are the only one effected and this makes chemical sensitivity more likely. Bromine is not common in pools - chlorine is very common. Bromine is much more popular in spas. Possibly, you were never previously exposed to bromine. It would be hard to imagine your not being previously exposed to chlorine. You might not be sensitive to bromine, but you could be sensitive to the inert ingredients that are unique to most bromine tablets. I suggest that you drain the spa completely. Make sure that you remove ALL THE WATER! Otherwise, bromine may be produced, after you add chlorine or shock. Instead of bromine, start maintaining the spa on chlorine. To reduce the amount of chlorine required, I suggest that you add an ozonator. This will greatly improve the water quality and reduce the chemical presence. Add a mineral sanitizer and you can come close to completely reducing the need for chlorine, on a regular basis. I hope that you will find this information helpful. Alan, I am a fairly new hot tub owner. For the first 8 months, I used the manufacturer's water plan. This is a brand new state of the art, expensive hot tub, 63 jets, and 450 gallons of water, (3) 6hp. motors, (1) 2 hp. anti-settling motor with four lower down jets. The system has a built in electro-static discharge ozonator, mineral purifier stick, and non-chlorinated shock treatments after each use. I also maintained the spa diligently with all other weekly chemicals as per instructions. On three separate occasions I used the hot tub and immediately started to cough. Twice, I got a high fever, chills, and sweats and was very ill. My doctor diagnosed bronchitis and put me on antibiotics. But, I had a sneaking suspicion that somehow the hot tub was responsible. I called the spa manufacturer and they said I must have let the pH drop causing an acid vapor problem, that I was breathing in. I raised the pH slightly and thought the problem was solved. Last Sunday I used the spa for 20 minutes. Monday morning I woke up coughing intensely, but luckily did not get the other worse symptoms. Someone told me about Mycobacterium Avian Complex (MAC), a microorganism that is naturally all over, but loves and multiplies in hot water. I did some internet research, and found that there is a growing problem with hot tub users getting a condition now called Hot Tub Lung. It is from aerosolization (caused by high-powered hot tub jets) of the high concentrations of the mycobacterium, and inhalation of same by the hot tub user. This is most always observed in indoor hot tubs, but mine is outdoors. The problem is, every symptom that these articles talked about; I had. I am now convinced that even though my hot tub is out doors, I still got hot tub lung from the mycobacterium that I now believe was running rampant in my hot tub. I really question whether the mineral purifier stick + ozonator + shock, was doing the job. After going to a new dealer, I just yesterday switched to biguanide, hoping this will solve the problem killing the bacterium. But, after reading several of your Q and A’s, I am now left wondering if everyone will eventually get PHMB resistant strains of mold or bacteria? It sounds like after about 3 to 5 years of use, it is inevitable. So, with all of this, I have three specific questions. 1) Have you ever heard of the condition of hot tub lung and what are your thoughts on it? 2) Do you think changing to a PHMB water plan will be better than the one I started on with my spa? 3) If it is inevitable that resistant strains of mold or bacteria will develop, why not just bypass the PHMB and go to a chlorine or bromine based system to start? Please help, as I love to soak and get a massage in the tub, but really don’t want to have permanent lung damage from it. Obviously, you have done your homework. There are medical issues here and I am not medically qualified. I suggest that you discuss any recommendations with your physician. I have heard of the hot tub lung problem. There is a Q and A on the Rashes and Irritations page. (Directly below this letter.) It seems to be something that occurs in inadequately sanitized indoor spas. Your spa is not indoors and would not appear to be inadequately sanitized. Low pH can result in irritating vapors. pH is simple to test. Either the pH was low or it wasn't! Probably, it was just clutching at straws. I would not use biguanide. The development of sanitizer-resistant microorganisms may not be inevitable, but from my perspective it seems that way. I only see one side, as mostly people with problems write to me about the product. I would reject its use simply based on the fact that it supports foaming and the presence of an ozonator will create bubbling. The bacteriology of the foam is different from that of the spa water proper. Good sanitation demands that the foam be eliminated periodically. I would prefer to use and ozone generator and bromine. Maintaining a 1-3 PPM level (lower than normal because of the ozonator) of bromine should provide backup sanitation for the ozonator. This will help confirm that the ozonator is operating properly, if only small amounts of bromine are required to maintain an appropriate level. You would not, necessarily, need the mineral sanitizer or the shock, so long as you ozonated the water for periods spread throughout the day. I have received letters about choking vapors that might be attributed to excess amounts of the potassium monopersulfate product. This is anecdotal and not backed up by data. There is another product to consider: ultraviolet sanitizing. It sanitizes without any chemicals. You will need to use it in conjunction with and an ozone generator and a persistent sanitizer such as bromine. However, uv sanitizing can be used with enzymes and high efficiency filtration and will greatly reduce the amount of ozone and other sanitizers required. I hope that this information proves helpful. Please let me know how it turns out. I read an article in my local newspaper a while ago about something called "hot tub lung." We're thinking about getting a spa and I was wondering what your thoughts are on this topic. I don't remember the specifics and would like to know if this is something that I should be concerned with. Thank you. Hypersensitivity pneumonitis or "hot tub lung" as it is more commonly called is caused by pathogenic (disease causing) bacteria associated with poorly maintained spa or hot tub water. It is primarily associated with indoor spas and can result when moisture, laden with bacteria, from inadequately sanitized water, is inhaled. However, this problem is the direct result of neglect and poor maintenance and sanitizing practices and is not the inevitable result of spa or hot tub usage. The conditions, in indoor spas, that can lead to this problem can be easily avoided by regular checking of chemical balances, the use of proper sanitizing methods, proper ventilation, following the manufacturer's recommendation for filter maintenance and the periodic replacement of the water. This condition should continue to be rare in outdoor spas and in any spa or hot tub that is properly maintained and sanitized. I hope that I have been helpful in reassuring you of the basic safety of the hot water experience. Hello I recently bought a new/used spa. It was bought new last year and only used for a month. the previous owner had it inside and winterized after one month of use. I installed the spa last week filled it and added chemicals. We are using bromine tablets in a floater. We added the other chemicals. My son, who is ten, appears to have gotten folliculitis. I test the water every day the bromine, pH and alkaline levels are in the ideal areas on the test kit. My question is could there have been bacteria left in the tub and filters from the previous owner? Should I drain the spa and start over? Does it have an ozonator and how often should I run the spa? Your help would be appreciated. Thanks. I suggest that a medical opinion be sought. Rashes can, also, be caused by chemical dermatitis and I cannot rule out that possibility. It is impossible to tell where the bacteria came from and it probably doesn't matter. If the spa was properly maintained, at all times, there should be no problems. Folliculitis is caused by the pseudomonas aeruginosa bacteria. When conditions are right, bacteria will grow. Bromine tablets in a floater do not provide a constant level of sanitizer. It is possible for the water to test perfect, but due to high bather usage the sanitizer level can become depleted. You can never test too frequently, especially during periods of heavy usage. Adding a quick dissolving shock will quickly boost a low or depleted bromine level. It is not apparent from your letter, if you are telling me you have an ozonator or asking me if the spa has an ozonator. An ozonator is a really worthwhile accessory. It destroys contamination and helps preserve the bromine for sanitizing. Ozonators require a backup sanitizer and bromine is very popular in this application. I suggest that you run the ozonator for 4,1-1/2 to 2 hour sessions, spaced throughout the day. That way the water is never more than 4-6 hours away from an ozonating treatment. For you own piece of mind, I would shock the spa, raising the bromine level to 10 PPM. A non-chlorine shock works well for this purpose. Draining the spa will not necessarily accomplish anything more than this treatment. The spa can be used when the bromine levels falls into the 3-5 PPM range. I hope that I have been of assistance. Hi there. I have just been reading your question and answer section and find them very informative. We purchased a hot tub in early August, 2000. After a few weeks of using it I started with a rash and a burning sensation on my skin every time I got in. We were using bromine as a sanitizer and have since switched over to chlorine. For a few weeks, I was fine then much to my dismay, I got another rash. I went to my family doctor, who treated me for folliculitis and we drained and cleaned our tub. She wasn't sure that was the problem, as the rash didn't look exactly like folliculitis. I must say I was the only one to have this rash. Now after getting in I am itchy and get raised red bumps again on my skin, under armpits, lower legs, small of the back. My husband has been getting itchy and has small red bumps after scratching. Do you think he may be having a reaction to the chlorine? Is it possible to switch back to bromine without draining the tub, as we have only just drained and refilled 2 days ago? I seem to be having a problem keeping the chlorine level from getting too high. I expect that may be my husband's problem. We use a holiday tender with chlorine pucks and the instructions said to set between 3-4, test daily and adjust accordingly. Most days, if there is only 1-2 people using the tub the chlorine is too high, we lower the setting and do not have enough sanitizer. We need help! Based on the details of your email, it is very likely that you have a chemical dermatitis. I suggest that you discuss this possibility with your doctor. You are using a form of chlorine that is not recommended, by any chemical manufacturer that I know of, for us e in a residential spa or hot tub. Those "chlorine pucks" are slow dissolving trichlor tablets that are widely used in swimming pools. The problem is that at the temperature of a spa or hot tub, about 40ºC, these tablets are no longer slow dissolving. Inasmuch as this product is 90% chlorine and is being used in a relatively small volume of water, it is no wonder that you are having difficulty keeping the chlorine level low enough. High chlorine levels can cause chemical dermatitis. The recommended level is 1-3 PPM and high levels may be difficult to measure, unless test strips or a tester, such as the ColorQ PRO 7 all-digital water analyzer are used. You can switch back to bromine, without draining the hot tub. Bromine tablets are truly slow dissolving, even at typical temperatures. Given the fact that there may be a predisposition to chemical sensitivity, I suggest that you give serious thought to adding an ozonator. Ozonators will help destroy organic buildup, oxidize wastes and impurities and help maintain sanitary water conditions. Bromine is very often used as a backup sanitizer, with ozonation. The combination of the two will allow you to get consistently good results and maintain a lower level of bromine. With proper ozonation you could get by with 1-2 PPM of bromine, as opposed to 3-5 PPM. Another, possibly better option, would be to use a mineral sanitizer, in conjunction with ozone. There would be much less need for chlorine or bromine and it should be more comfortable for the bathers. This is really the way to go, given the track record. I hope that I have been helpful. My husband and I use bromine in our hot tub because our distributor said that it lasted longer in hot water than chlorine. Can a fungus such as ringworm (tinea corporis) or athlete's foot (tinea pedia) survive in temperatures of 102 degrees and along with the bromine? Thank you for your help. Medical problems need the services of a medical doctor. I'm a chemist - not a bacteriologist, so what I can contribute is limited. The temperature of 102ºF should not be expected to kill any of the potentially infectious microorganisms. So far as I know, from my vantage point, the problems that you are describing are not the object of anyone who has ever written to me. And that's a lot of spa and hot tub owners. I am not sure whether you are asking if these conditions can be spread by spa activity or whether the chemistry of the spa will destroy or promote them? In either case, I am unsure, but would suspect that a properly sanitized spa or hot tub would not be the cause of the problem. The most common cause of a spa irritation or rash is due to folliculitis. Folliculitis, an inflammation of the hair follicles and is caused by the pseudomonas aeruginosa bacterium and can result from exposure to inadequately maintained water sanitation conditions. Proper maintenance of the sanitizer levels helps to avoid this problem! However, this not what you are describing. Damp body conditions, after the spa has been used, can be a contributing factor, but that is not necessarily spa dependent. I'm sorry that I can't be more specific. If you locate information, of a more definitive nature, I will add it to the archives. I developed an increasingly severe rash within two months of installing a spa. The appearance of the rash was very similar to some published descriptions of Bromine Sensitivity or Pseudomonas Folliculitis. After a lengthy period of trial and error it became clear that the rash was caused by a reaction to persulfates (e.g. peroxysulfate, peroxymonosulfate) used in Shock / Non-Chlorine Shock / Active Oxygen systems. I have prepared a detailed report which I hope will be published in one of the dermatology journals - please ask if you want me to send a copy. Although Persulfate allergy is a recognised cause of skin reactions in users of hair-dressing products, I cannot find similar reports which refer to spa users. However it took a medical training, an interest in dermatology, and a lot of determination and discomfort to confirm my diagnosis. I wonder how common it really is? You have linked two completely unrelated issues: the sensitivity to persulfate use in hair bleaching and the use of monopersulfates in spas. By chance, I might be only one of a few people you that could have found that understands this difference. I formulated such hair stripping products (refer to the "About Alan" bio), in the late 60's, and they do not contain monopersulfates. Hair strippers contain potassium and/or ammonium persulfate. These materials are powerful oxidizers and are highly dangerous to handle and are not used in the pool or spa industry. In hair coloring treatment, these persulfates are further activated by the addition of ammonia and the extremely caustic sodium metasilicate. In the pool and spa industry monopersulfates are used as oxidizers. Monopersulfate compound (also called potassium peroxymonosulfate) is a triple salt of potassium persulfate, potassium sulfate and potassium bisulfate. This product was created to be relatively safe to handle and use in a variety of applications. In a spa, the product is used at a pH of 7.2-7.8. In actual use the product will oxidize organic matter and will react with chloride or bromide salts, converting to the sanitizing forms of chlorine or bromine: hypochlorous acid or hypobromous acid. I have no information, as to the irritation potential of excessive concentrations of monopersulfate. Too much of most any active chemical can be irritating. The byproducts of monopersulfate use are innocuous potassium sulfate salts. Folliculitis can simply be the result of inadequate sanitation and not related to bromine sensitivity or chemical dermatitis. The concentration of the oxidizers and the pH, in these very different applications, is totally out of proportion to one another: a few PPM vs. tens of thousands of PPM and a pH of 7.4 vs. 10 +. I hope that I have been of some assistance and, yes, I would like to receive a copy of the article. ► Sensitive To Spa Water? I wrote to you earlier this year about a problem I am having with my spa. I will review the problem. Two years ago I installed a spa. My wife and I enjoyed its use almost very night for about three months. Then my wife started to get an itch that would not go away. She went to her doctor and then to a dermatologist. He said my wife had eczema and advised her to have a warm bath after using the hot tub and he prescribed some creams. My wife is 68 years old and has never had skin problems so I had some doubts about his findings. She continued to use the hot tub about once a week but the itchiness continued. So early this year I thought that I would change from bromine to chlorine and sought your advice on the change over. I have been using chlorine for about six months and there is no improvement in her condition. I still suspect that my wife is sensitive to some chemical in the hot tub. I substituted baking soda for the alkalinity control and now am wondering if it is the chemical causing the itchiness. Would you please comment on this? If you think it could be the problem, should I empty my spa and start with a store bought alkalinity agent? Thank you for your help. I doubt that the baking soda is part of the problem. It is amongst the most innocuous of chemicals. Bromine contributes certain byproducts to the water and if you did not drain the spa before switching, I suggest that you do so at this time. Otherwise, even though you are adding chlorine, it is being converted to bromine. My best suggestion is that you have an Ozone Generator installed (unless the spa came with one already installed). This will allow you to use far less chemicals to maintain sanitation. In fact, you could use the Ozonator, in conjunction with a mineral sanitizer and high efficiency filtration and be completely chlorine and bromine free or come very close. Good luck and I hope that this leads to a solution. We purchased a hot tub this summer, and after 3 weeks of use I developed a terrible rash. My doctor told me I probably had an allergy to chlorine as no one else in the family got this rash. We need to switch from chlorine to bromine. My question is do we have to dump the tub to switch over as you do when switching from bromine to chlorine? It is not absolutely necessary to empty the spa if you are switching from chlorine to bromine. The solid forms of bromine a actually contain some chlorine, which will be converted into bromine. However, given your situation, I would suggest that you empty the spa and thoroughly clean it. This way you will be starting with a clean page and the future experiences can be better related to the current chemical treatment. There are two means of adding bromine: a two part system and bromine in solid forms. Either way, I suggest that you add a dose of a sodium bromide product to build up a reservoir of bromide salts. This will help prevent the availability of any form of chlorine - everything will convert to bromine. Given your experience, you might want to consider adding an ozonator, as it will help reduce the amount of chemicals being added to the water. I hope that I have been helpful. Is there a link between hot tubs and yeast infections? We recently set up a used tub. Shortly thereafter, my wife was diagnosed with a yeast infection. The same thing happened over a year ago after being in a friend's tub. Any advice would be appreciated. I just found your site and have already added it to My Favorites! Thanks. This is a medical matter and your wife should be seeking medical advice and treatment. So far as I know, yeast infections are not common in spas. At least none has ever been brought to my attention. Bacterial infections are the most common problems and are associated with poor sanitation practices. It is impossible for me to rule out this possibility. You provided no information, as to type of sanitizer being used. If you get back to me with this additional information, I will make a recommendation, as to a suggested next step or sanitizer modification. I hope that I have been of some assistance. Thank for such a quick reply. I started it up and ran it about a week before starting any treatment (I think she was in once during this time). I bought a starter kit and followed its instructions -> Stain control > water tested at store > 1 pouch shock > Bromine until 3-5ppm > Enzyme > maintained bromine for following week > Infection diagnosed (by doctor). Thanks. Using the spa before a sanitizer level was established was not a good idea. However, now you seem to be maintaining proper control. All of this could be coincidence. Remaining in a wet bathing suit, for long periods of time, could be part of the problem. All I can suggest is that you try to maintain a 3-5 PPM bromine level for at least 1/2 hour before each use of the spa. What is folliculitis.? How do you get it? How do you prevent it? Folliculitis. is an inflammation of the hair follicles and is caused by the pseudomonas aeruginosa bacterium. The warm water of the spa opens up the pores and enables rapid bacterial growth, if the sanitizing is inadequate. Folliculitis can appear as small red pimples. Persons exhibiting such symptoms should seek medical attention. Rashes or pimples can also result from chemical dermatitis, caused by improper water conditions: very high or very low pH or very high sanitizer levels. Medical services should be sought to determine the cause and treatment. The way to avoid folliculitis in spas and hot tubs is to maintain proper sanitation at all times. There is no doubt that folliculitis is a consequence of bad sanitizing and/or water maintenance. However, some individuals can be sensitive to some of the routine chemicals and/or byproducts and may benefit from a switch to another means of sanitizing. The testing of the sanitizer level prior to bathing can help avoid exposure to the problem. I hope that I have been helpful. Our spa is maintained with an Ozonator and bromine tablets. The water always looks to be in good condition and I test the chemistry on a regular basis. I try and keep the bromine level at 1-2 PPM, as I was told to do. We use the spa for a reasonable period, 3-4 times a week. I have absolutely no problems. My wife seems to get a rash every now and then. Am I doing something wrong? Thank you. It doesn't sound like you are doing anything wrong. It may simply be a case of your wife being sensitive to some of the chemicals or byproducts. You didn't mention how often the spa is emptied and cleaned, but it should be at least every 2-3 months, especially in your case. The bromine tablets that you are using, leave an organic chemical behind and it is possible that your wife is sensitive to that chemical byproduct or the bromine itself. I suggest that you completely drain and clean the spa. To test the theory of something to do with the bromine, switch to another backup. You can use chlorine or even better would be an Ionizer or Mineral Sanitizer. These products rely on copper, silver or zinc ions, in functioning in the sanitizer role. The combination of ozone and minerals will reduce the total chemical usage and, hopefully, make a difference in bather comfort. Browse through the archives for more on alternative sanitizers. Good luck and I hope that this information will prove to be helpful. There is bad smell in the tub that burns your eyes and mouth and it leaves a stinging taste on your tongue. The tub sits outside with a cover, the water is clear. We use all of the biguanide spa chemicals. Proper use of the chemicals should not be creating such spa odor problems. I suggest that you bring in a water sample into a local spa professional. Low pH conditions could be a cause of the odor and irritation. In addition, biguanide can lead to the development of resistant micro-organisms. A properly maintained spa should never exhibit the type of smells, irritating conditions or odors, that you are describing. The water analysis should help pinpoint the problem. Please refer to other topics in the archives for more information. I hope that I have been helpful.